Max Corkill and his cat Rastus achieved celebrity status as they motorcycled the roads of New Zealand and Canada, raising money for charity. Rastus, wearing a specially made helmet, rode the petrol tank of Max's 1952 motorcycle, leaning into the wind. The two of them owned a company that sold Rastus T-shirts, posters, and other items with Rastus' signature paw print "autograph." Sadly, Max and Rastus were both killed in a collision with a car in 1998. A passenger on the bike, Gaynor Martin, was also killed. Click here to visit a Max and Rastus tribute site sponsored by Pets on the Net. 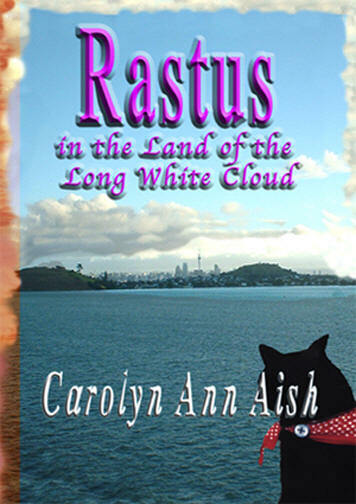 In this series by Carolyn Ann Aish, told with clever rhyming, Rastus the Cat dictates his life story, in which cats own people. WORLD FAMOUS DUO – BIOGRAPHY of the lives of Max Corkill and his Cat Rastus. 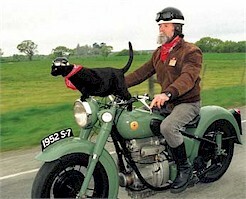 MOTOR-CYCLING was the favourite pastime of this FAMOUS cat and his owner. In the middle of this book is a detailed account of Max's customizing of his motorcycles and motorcycle accessories. The rest is an historical account of Max Corkill and his famous cat, Rastus. Born in Taranaki, having lived in Canada and become owner and friend to Rastus the cat, (who was born in Canada) - they biked together in the U.S.A., then Max returned to New Plymouth, New Zealand, followed by Rastus after 6 months in Hawaii in quarantine. A road tragedy in 1998, took their lives. Read the whole account. Over 70 colored photos. Documents information, with photographs of Max's motorcycles. Published in 1998, First Edition Copies still available, but limited numbers. No plans at this date for a second print. 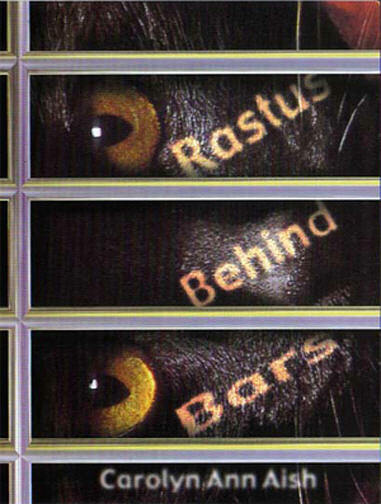 RASTUS Year One, Hide Kitty Hide! 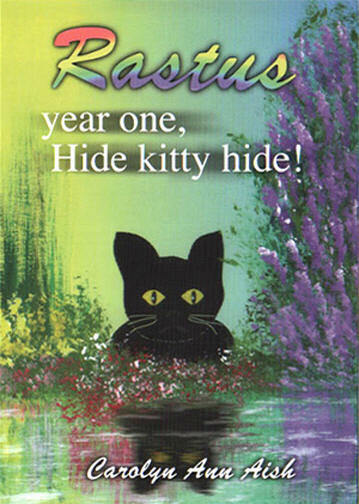 Rastus, Year One, HIDE KITTY HIDE True story, about Rastus as a kitten. 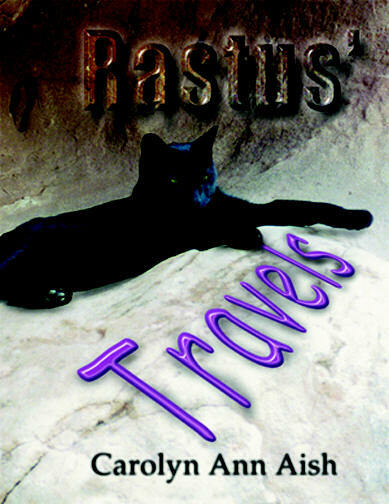 The first book in the Rastus Series. Rastus meets Max Corkill, in Canada. A story of true friendship. COLLECT the whole set. True story, second book in the Rastus Series. Rastus learns to ride on Max's motorcycle. If a CAT can ride a motorbike, WE can do anything if we set our mind to it, and practice. Great encouragement and motivation for children as well as adults! This new edition comes with some color pictures. Successes come in CANs, failures come in CAN'Ts. True story, the fourth book in the Rastus Series. Rastus travels to Hawaii to be locked in quarantine BEHIND BARS, for six months before joining Max Corkill in New Plymouth, New Zealand. It was a hard time for Rastus. But every cloud has a silver lining, and Max and Rastus were re-united. Rastus was so pleased to be able to ride on the motorcycle again! Magazine-style book, written for children, but collected by all ages. True story, the fifth book in the Rastus Series. Rastus arrives in New Zealand and discovers that 'home' is not a building. Color photos of homes that Max lived in, including his first home with his parents in Inglewood. Magazine-style book, written for children, but collected by all ages. True story, the sixth book in the Rastus Series. 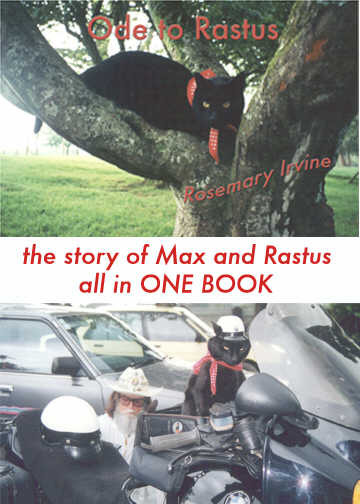 Rastus, the motorcycling cat and his owner, Max, are featured on T.V., and in the newspapers. 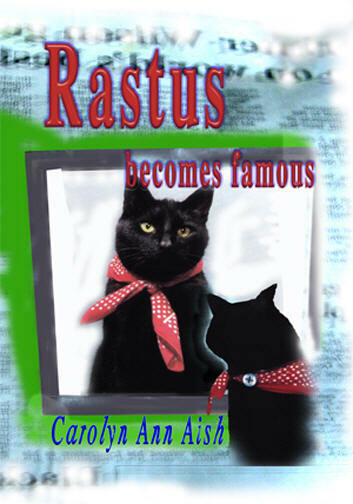 Fame is something new to deal with, Rastus finds. Like the others in this series, this book is told from Rastus' point of view. Fun to read. Collect them all. Magazine-style book, written for children, but collected by all ages. 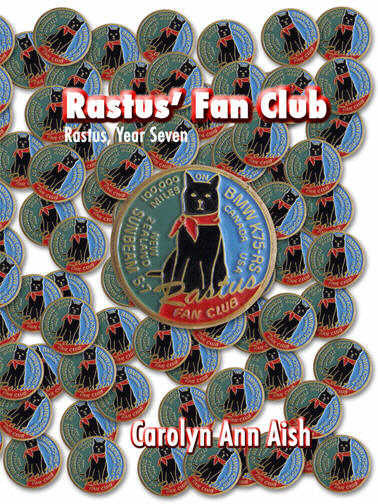 True story, the SEVENTH book in the Rastus Series, launched, October, 2006. Written for children, collected by all ages. Rastus 'talks' about his fan club. More than 24 color photos (some never published before). The fans, of course, THE FANS! - some of the badges, the paw-print stamp, the charities. Magazine-style children's book with soft cardboard cover, approx. A5 format. Collect all of the RASTUS BOOKS. 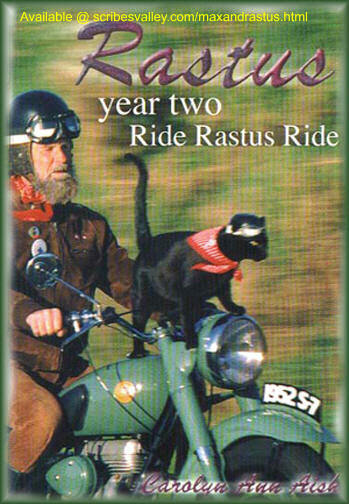 The story of the whole life of Rastus the world famous motorcycling cat, and his owner Max Corkill, told 'by Rastus' in poetry form. A5 Landscape format with soft card cover, some previously unpublished photographs all in colour. Sixteen pages. A lovely little book for children and collectors that tells the whole story of Rastus's wonderful little life and tragic death.